Defenders’ Days is a conference with and for human rights defenders. 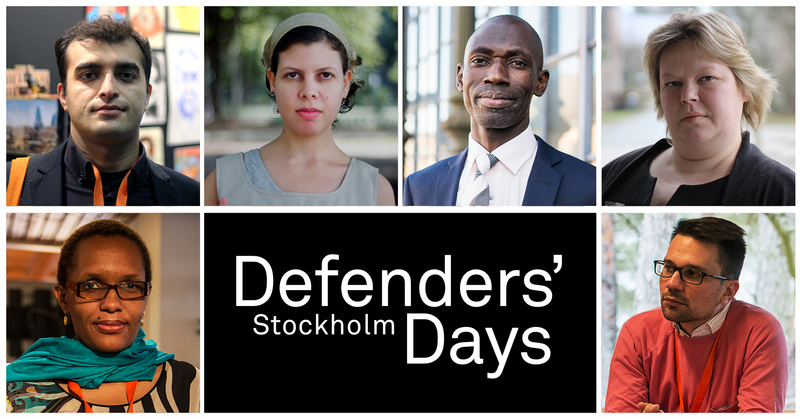 Defenders’ Days is one of the world’s largest conferences with and for human rights defenders. It is organised by Civil Rights Defenders and takes place in Stockholm every second year in April. In 2018, roughly 200 human rights defenders from five continents participated in the conference. The purpose of the conference is to strengthen and support human rights defenders. It is also to create opportunities for networking and exchange of knowledge between people who everyday, despite risks to their own safety, fight for democracy, freedom of expression, and human rights. The conference includes workshops for, and together with, human rights defenders. Defenders’ Days offers a broad list of topics to learn more about, such as digital security, psychosocial aspects of security, and innovation as means to combat human rights violations. strengthen the recognition of human rights defenders and highlight the situation of human rights defenders at risk. Civil Rights Defenders’ ambition is to make sure that the participating human rights defenders leave Defenders’ Days with enhanced knowledge in relevant topics as well as a feeling of strong moral support from the international community. Defenders’ Days was first organised in 2013, and held annually until the strategic decision was made to organise the conference every two year. The most recent Defenders’ Days was held in 2018 and gathered over 200 human rights defenders from five continents. The previous conference agendas, including information on workshops, trainers and panellists, can be found in the list below. To see updates and news live from the conference, follow #defendersdays in social media.